Last night, SpeedyKate and I hosted a citrus-themed dinner party. Everything – from appetizers to entrees to side dishes to desserts – had to contain some sort of citrus. Why? Well because wintertime is citrus’ time to shine! In a lovely juxtaposition to the outside gray wintery winter, nature has compensated for its dreariness by providing us with bright and colorful and fresh citrus flavors in December, January, and February. Lemons and limes oranges and tangerines and grapefruit galore! I have not always loved grapefruit. Like most kids, I hated how bitter it was and could not possibly pour on enough sugar to compensate. Then at some point mid-high school, I magically became a huge grapefruit fan. I don’t eat it for breakfast with a serrated spoon (because that just results in a grapefruit slushy mess), I prefer to peel mine – first the rind, then the skin – until all that’s left is the ruby-red delicious insides. And then every few bites I dip it in sugar, because I can and it is delicious. Anywho, baking with grapefruit is new to me and I will definitely be doing it again. 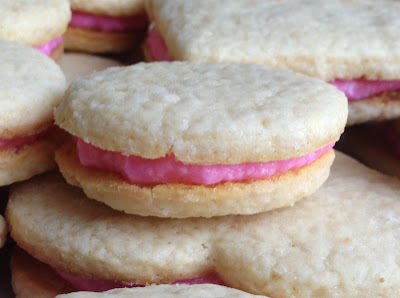 These cookies have juice and zest in both the cookies and the frosting. 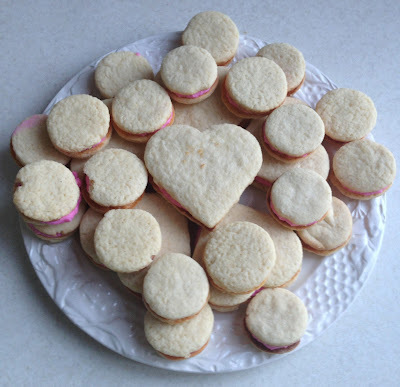 You could make them with any citrus actually – I imagine some sunshine-y lemon cookies would be delicious. So I got a little carried away with the food coloring in the frosting…but in light of a certain upcoming holiday, I don’t think that’s too much of a disaster. 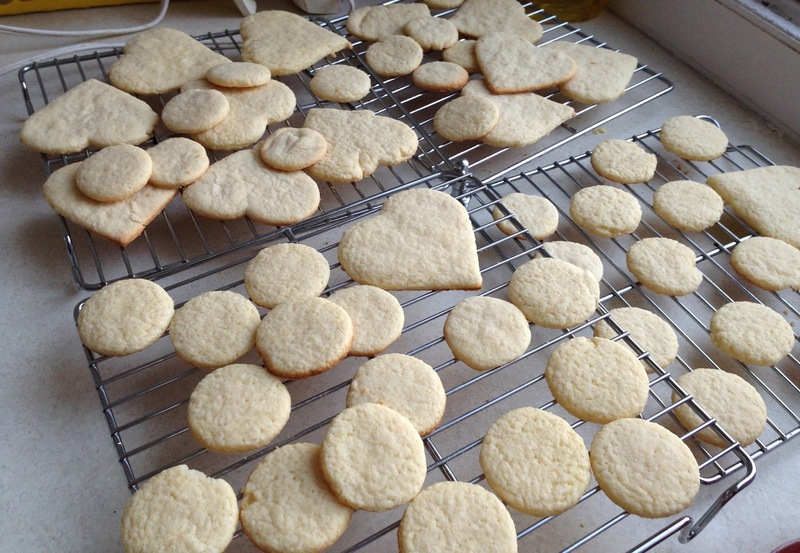 Make the Cookies: In the bowl of your mixer (or in a large bowl using a hand mixer), rub together the sugar and grapefruit zest with your fingertips until the zest is evenly distributed and all of the sugar has been moistened. Add the butter to the bowl and beat on medium speed until the mixture is light and fluffy, about 3 minutes. Add the egg yolks and beat until combined, scraping down the bowl as necessary. 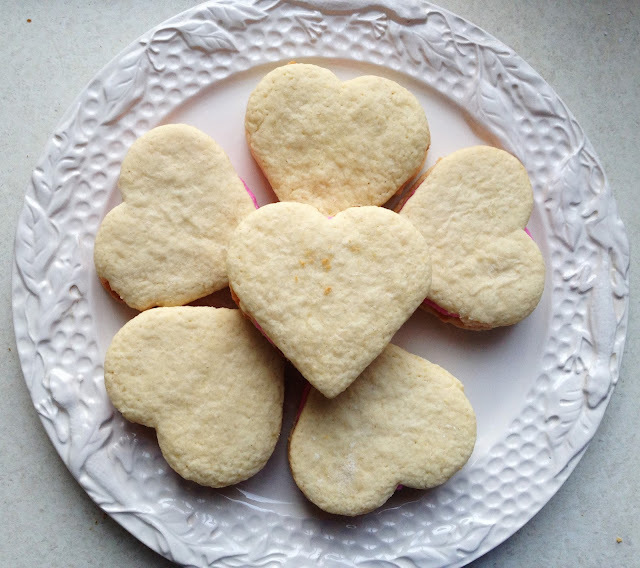 Reduce the speed to low and add the flours, baking powder, and salt in three batches (go ahead and slap me on the wrist – I never mix my dry ingredients in a separate bowl…it just feels so unnecessary), alternating with the grapefruit juice, beginning and ending with the flour. Mix just until the dough comes together. Transfer the dough to a piece of plastic wrap, pat it into a 1-inch disk, wrap in the plastic wrap and refrigerate for at least 30 minutes, or until firm (overnight is fine. Preheat oven to 350 degrees F. Line two baking sheets with parchment paper or a silicone baking mat. Just spraying the pans isn’t enough here! Be warned, they will stick! Roll out the dough on a lightly floured surface to about ⅛-inch thick. 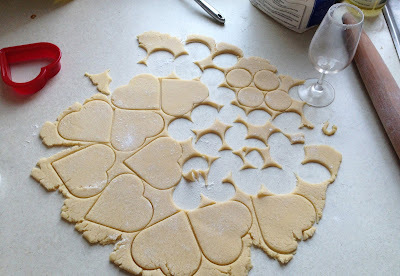 Use a 2-inch round cutter (I used a wine glass and a heart-shaped cutter), to cut out as many cookies as possible and transfer them to the prepared baking sheets, spacing them 1-inch apart. Gather together the dough scraps and repeat to get as many rounds as possible. 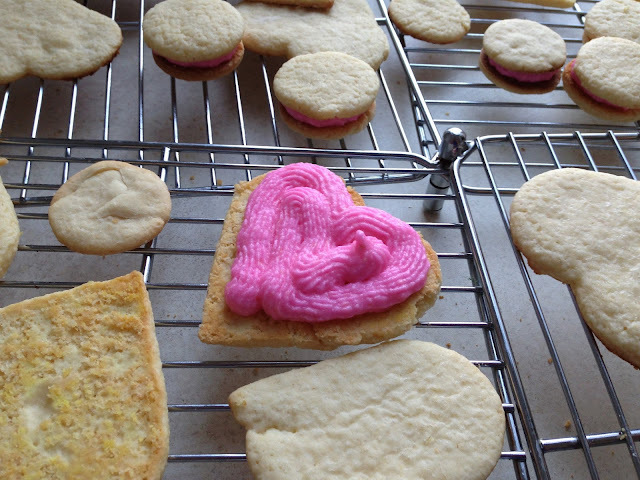 Refrigerate the baking sheets (with the cookies on them) for 15 minutes. Bake the cookies until just barely golden brown around the edges and still very light in color in the middle, about 12 minutes. 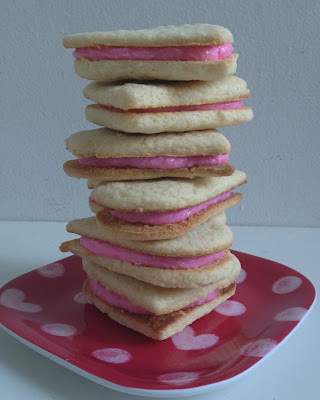 Immediately remove the cookies to a wire rack and cool completely before assembling. Make the Filling: Beat together the butter, powdered sugar and grapefruit zest on medium speed until light and fluffy, about 5 minutes. 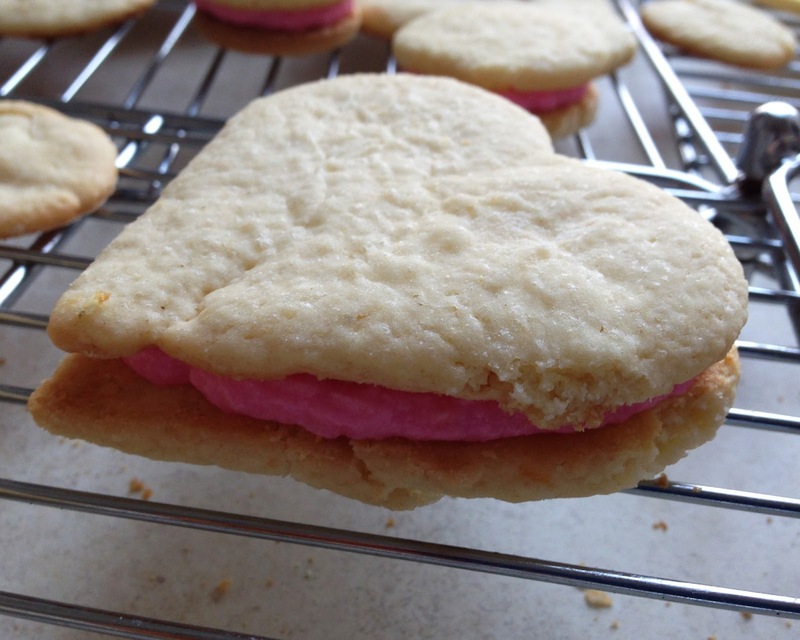 Add the grapefruit juice and food coloring (if using), increase the speed to medium-high and beat until smooth. Assemble the Cookies: Match up the cookies by size, then spread or pipe on about 1 tablespoon of filling onto the flat side of half the cookies. Top with the matching cookie and press down slightly so the filling is pushed to the edges. Store in an airtight container and serve at room temperature.